By Sarah Hunter. Originally printed in the AMC Maine Chapter Winter 2018 Newsletter; reprinted here with permission. 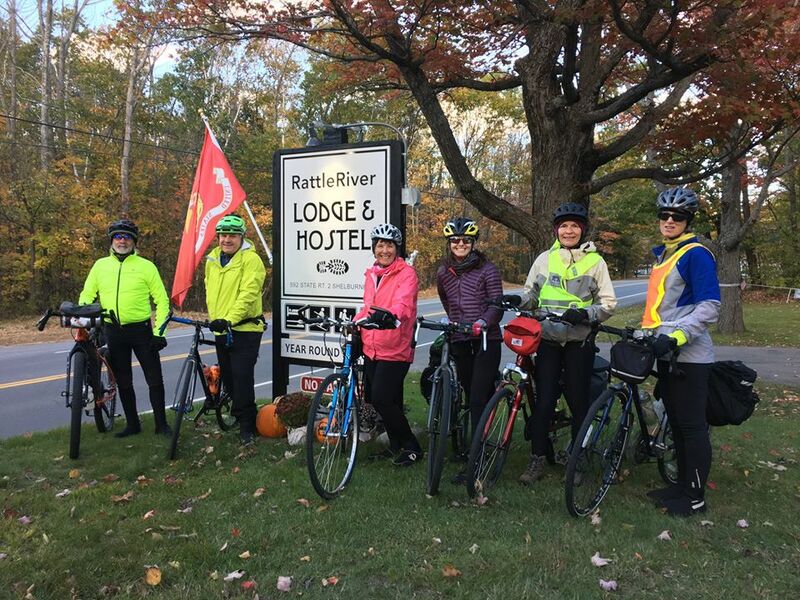 Challenging climbs, thrilling descents, and stunning scenery framed our White Mountains cycling adventure this fall, while comfortable lodging, good company and camaraderie made this trip truly great. 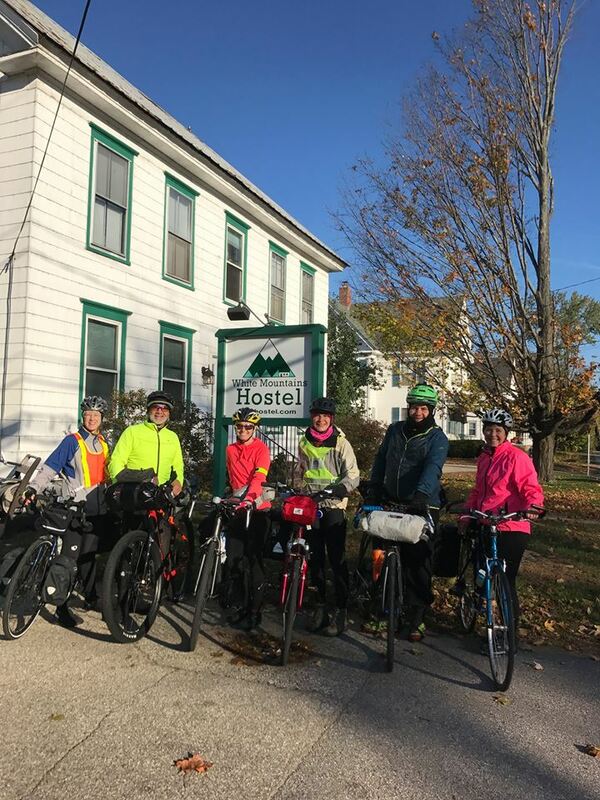 It was late October when I joined a group of intrepid cyclists on the brand new 130-mile, hostel-to-hostel cycling tour through the White Mountains, a collaborative project offered by the Notch Hostel, Rattle River Hostel, and White Mountains Hostel. We began at White Mountain Hostel in Conway, on a bright, chilly morning. Mt. Washington stood in the distance, cloaked in white. The edges of the Kancamagus Highway were brushed with a light covering of snow on that first morning and in the shadows a thin layer of black ice was waiting. Two of us slipped, toppling onto the pavement. We decided to stay off of the edges, off the white line, and be alert. The sun was getting higher; the ice wouldn’t last long. It was a Friday morning, past peak foliage, and the traffic was light. We rolled along as the sun rose higher, filtering through the muted golden leaves. We continued to climb, stopping at overlooks to enjoy the scenery and provide cheers of encouragement as each new member of the group came into view. Arriving at the height of the land, we celebrated with a group photo at the Kancamagus Pass sign. The rest of the day was downhill to the cozy Notch Hostel in Woodstock, where we were greeted by the owner, Serena Walsh. After warm showers and some much-deserved time in the sauna, we piled into the Notch Hostel van for a ride into town and a delicious meal at Woodstock Inn, Station & Brewery. We spent the evening sharing bike trip stories and ideas. On our second day we meandered through—and up—Franconia Notch on a paved, multiuse recreational path that had become a mosaic of fallen leaves. Later the Northern Presidentials dominated the landscape as we rolled down the wide shoulders of US Route 2 into Shelburne. At the end of our 53-mile day, we arrived at the lovely Rattle River Hostel to find owner Erik Barstow working in the yard. We tucked our bikes into the gear room, showered, and were whisked off to another incredible meal at Libby’s Bistro & SAaLT Pub. Our last day was icy cold. Armed with proper winter cycling attire and hand warmers for extra security, we took off amidst flying snowflakes. The climb to Pinkham Notch was made tougher by the biting wind, but that only made the blazing fire and spicy chilly at the visitor center all the more inviting. We soaked up the warmth and ventured back out into the cold with renewed energy to finish the ride. The rest of the miles came easily, and we were back at our cars at the White Mountain Hostel by mid-day. This was a terrific trip and one that left us all dreaming of our next cycling adventure.